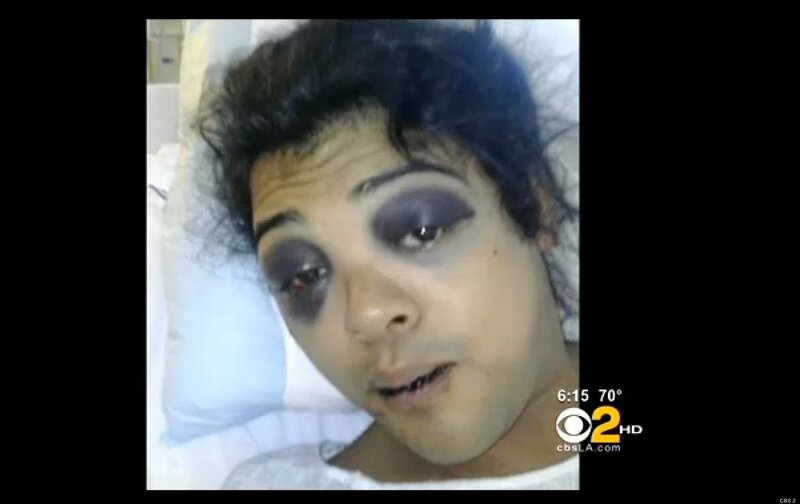 Victor Diego, 22, transgender and gay victim of brutal beating on Hollywood Boulevard [CBS 2 photo]. Hollywood, California – A 22-year-old transgender person who is identified as “gay” and male by his close relatives was brutally assaulted by a gang of men on Hollywood Boulevard near the Metro Station. Victor Diego, a barista at Beso’s Restaurant, had gotten off work and dressed to go out with friends, according to CBS LA, when the men attacked Diego form behind, fracturing two ribs, shattering his cheekbone, punching him multiple times in the eyes, breaking his jaw, and kicking him in the temple–an injury that his sister says will require surgery. Diego’s attackers did their worst and fled the scene, leaving their victim helpless in the street. “He was basically left for dead just because of who he is,” Virginia Diego said to CBS. Reportage on the attack has been careful to note that how Diego identifies in terms of gender identity and gender expression is not known. His sisters Virginia and Melissa have used both male and female pronouns to describe Diego, which reflects family practice, but not necessarily Diego’s own sense of personhood. Photographs show a graceful, lovely person with a sense of style and taste. Sister Virginia Diego said to reporters, “Sometimes men try to talk to him and they get humiliated in front of their friends when they realize it’s a man. Because he looks really good, he looks like a woman, you couldn’t tell the difference,” she continued. Sister Melissa Diego said that the Los Angeles Police Department, Hollywood Division is pursing the case as a transphobic hate crime. “We don’t want this to happen to anybody else,” she said. We just want somebody to come forward and let us know what they saw. He deserves justice.” Diego is recuperating at Cedars-Sinai Medical Center in Los Angeles. Update: GLAAD reports that the victim has informed the LAPD of her preferred name and pronominal usage. In contradistinction to her family’s identification of her gender, the victim wishes to be known by “Vivian,” and indicated that she wants police and the media to use feminine pronouns when referring to her. Diego shows multiple injuries sustained in Thursday night’s attack. Fox News Latino reports that Hollywood’s Beso Restaurant where young Diego works is owned by actress Eva Longoria, famed for her roles on The Young and the Restless, and Desperate Housewives. The film and television star has not issued a statement in relation to the attack. As the manhunt for Vivian Diego’s attackers continues, we are left to speculate about the rising number of anti-gay, anti-lesbian, and transphobic bias attacks reported recently, especially in New York City where the incidents of hate crimes is spiking to record highs as LGBT Pride celebrations kick off in the Big Apple. 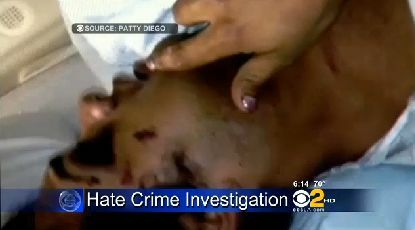 Is this hate crime attack against a gay and transgender person connected in some copycat way to the wave of East Coast brutalities? Some pundits suggest that the recent emphasis on the high profile human rights cases before the U.S. Supreme Court, and the increasing number of states making marriage equality legal for their residents may be igniting hostility among the opponents of LGBTQ rights in America. For now, Vivian Diego has more immediate problems: facing surgery and how to pay for it, recuperating from the shattering physical and mental experience of being attacked for who she is–a crime unthinkable among fair minded people, but brutally frequent in the swirling emotions surrounding the expansion of human rights in the United States.